Consultant and educator, Kevin Kaiser is known as a role model and advocate for the Okanagan’s Indigenous youth. Kaiser graduated from the University of British Columbia with a Bachelor of Education in 2002 and Masters of Educational Technology in 2009. He taught in Ontario briefly, then moved back to BC and began teaching in the Central Okanagan School District. He earned the Premier’s Award for Teaching Excellence for developing First Nations English 9. As a K-12 Aboriginal education resource educator and consultant, he served on the committee to develop the Central Okanagan School District’s second Aboriginal Education Enhancement Agreement. The agreement’s goal is to match Aboriginal student achievement with non-Aboriginal students, and to develop students’ physical, intellectual, spiritual, and emotional abilities. To support these aims, Kaiser invited Indigenous authors and presenters into his classroom to serve as role models for his students and to build connection between youth and the wider Aboriginal community. 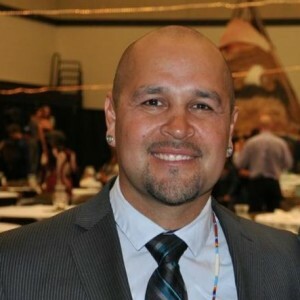 He likewise introduced a mentorship program for Indigenous youth in the district, and developed free workshops for the Okanagan community on cultural sensitivity and the unique needs of Indigenous learners. In 2013 and 2014, Kaiser co-authored the annual Aboriginal Education reports for the school district. The reports celebrate Aboriginal students’ achievements as valedictorians, science fair winners, academic stars, and spiritual leaders. Under his leadership and modelling, his students took the creative lead on a number of community events, including “Warriors for Change,” a 24-hour drum-in to raise awareness of Aboriginal education.